How many of you have left your Christmas decorations up until way into January? Usually that's me. This was the year I determined to get it all put away and redecorated right after New Year's. I had everything packed up except the tree before I remembered the Christmas tree box fell apart when we brought it out of the shed. The tree stayed up until February. Once I got our new Christmas tree storage bag and the tree was packed away, I resumed my plan: clear everything out of the rooms and give it a chance to "breathe" for a few days before bringing in any other decorations. I removed everything but the wall art. Those few days stretched into a couple weeks because, after all, I'm the one in charge of this show and I'm a turtle. My Nana always said I had two speeds: slow and slower. Since I took so long to get around to it, spring is nearly here. 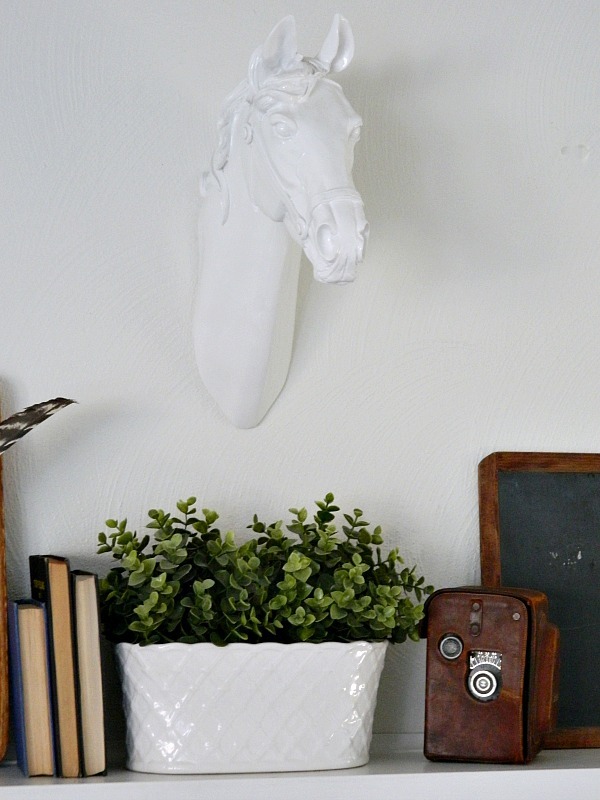 I skipped straight over winter decor and went straight to something that works for anytime but has a subtle spring theme too. 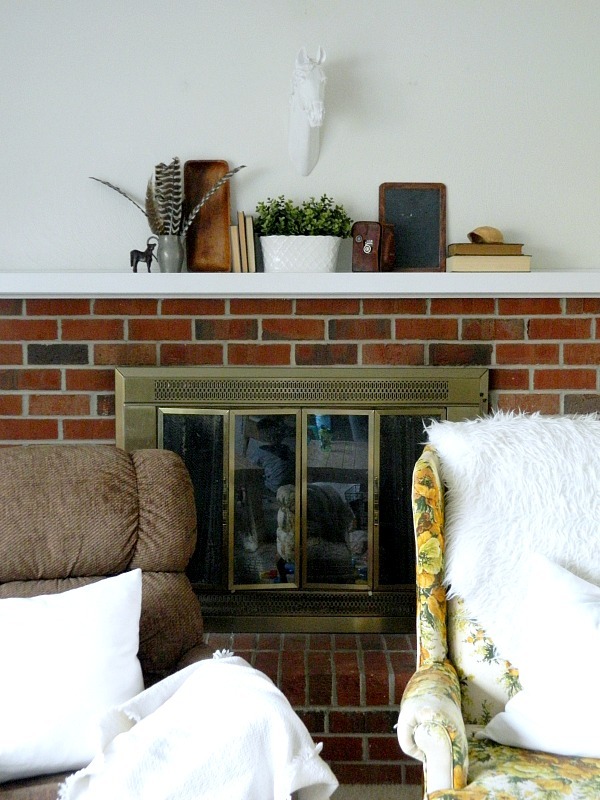 I made sure to use all neutrals to make it work with our new(to us) retro flower chair. It need reupholstering but I'm planning on a slipcover for a temporary fix because that print is way too cool to paint over. 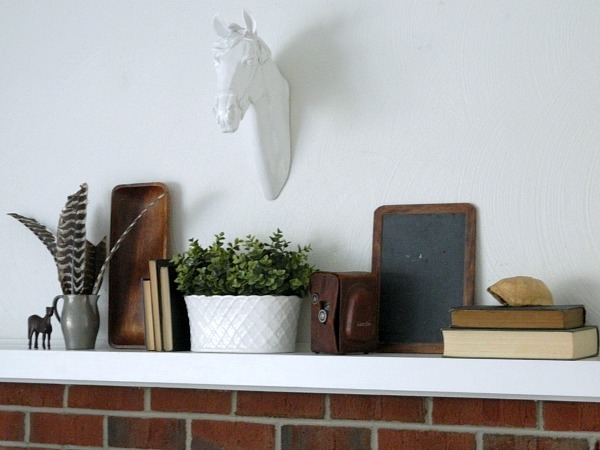 This may be my favorite mantel decor so far. Why? Because nearly everything I used has a special meaning or memory attached to it. That camera belonged to my great-grandpa. The silver pitcher was my grandmother's and the feathers were found on land belonging to Hubby's grandparents. I've had the turtle shell since I was a little girl, I bought the small horse figure on a trip to Mexico, and the wooden tray was used at our wedding. I love horses and we both love books. 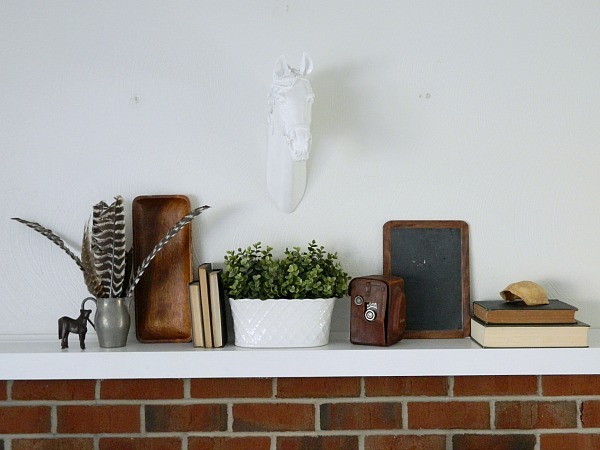 This mantel tells a story about us. 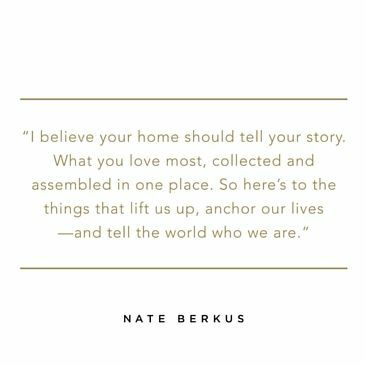 Decorating with the things we love, that tells our story, makes a home so much more than the four walls that keep the rain out. It makes it meaningful. It creates bridges for the spaces between people by telling others who you are. You are not the sum of your things, but without your story connected to them, those things are merely empty trinkets. Use the things you love, not the things you think you should use because it is a trend, or was expensive, or because it was a well-meaning gift from your great-aunt Josephine in Ohio whom you have only seen twice in your life. If you love it, use it. Tell your story, in the way only you can.